It comes to that time of year, where Ashley goes a little off topic, and discusses her ventures at “SuperCon.” Last year was the first year for “SuperCon,”in Raleigh, NC; it proved a success and this year undoubtedly reassured that it’s not only good for Raleigh, but good for those that need to escape into their fantasy worlds. “SuperCon,” is a three day festival for fans of pop culture, superheroes, science fiction, fantasy, anime, cartoons and video games. Last year, I met Levar Burton of Star Trek and Reading Rainbow, Jason David Frank, the Green Power Ranger from the Power Rangers series and the infamous wrestler Ric Flair. Let me tell you a little about my Saturday! Just like last year, myself, my boyfriend Stephen, and his best friend Jarrod all journeyed together to Raleigh. We discussed who we wanted to see, what panels we wanted to go to, and lastly what we wanted to BUY! Once in Raleigh, parking was supposed to be a mess, but the city of Raleigh was prepared, we paid $7.00 for all day parking! Take that DC! We knew we were in the right place once we saw Sir Walter Raleigh with a lightning bolt on his chest! We got inline to redeem our tickets; and of course saw some great cosplay: which is the practice of dressing up as a character from a movie, book, or video game. The thing about these conventions is that you can be who ever you want to be and there is no judging. You will get a high five for being the weirdest! We got our schedules and set our plans for the day. First stop, the main floor, to look at the merchandise and mostly, for me to fill out surveys to get free stuff! While we were looking around, we met Michelangelo, the orange turtle from Teenage Mutant Ninja Turtles! 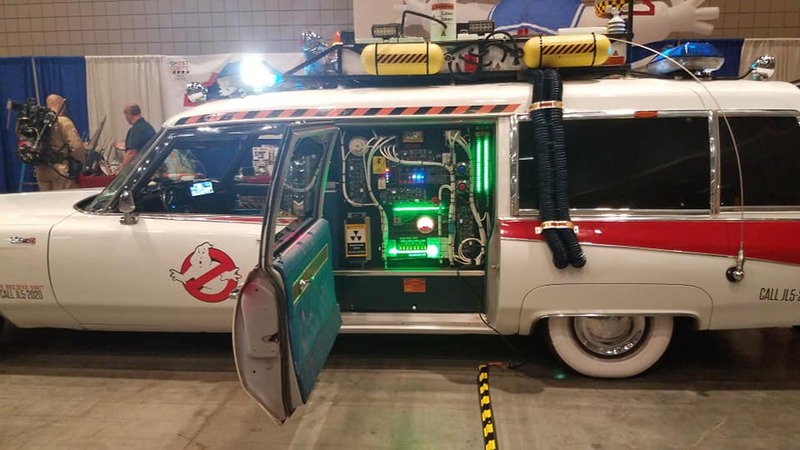 Then the infamous, Ghostbusters car, and characters from Star Wars! I managed to get a 2 free bags, a kazoo, and coupons to Dave and Buster’s. A win for me! First panel we went to was the Pink Ranger from the Power Rangers, Kimberly Ann Hart. She looked just like she did when she was in the show! Yet, the panel was uneventful, we ended up leaving half way thru. We walked around some more and took in the cosplay outfits. 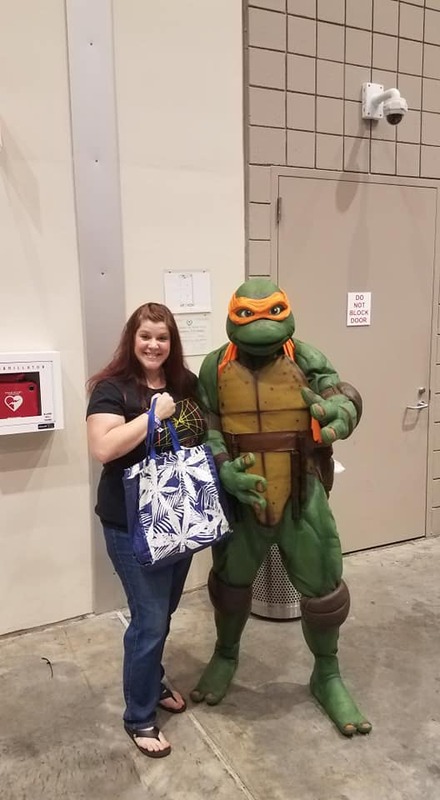 I ended up leaving Stephen and Jarrod to go out on my own, let them have their “guy time.” I met a cosplay of Casey Jones, from TMNT, Beast from X-Men, and Deathstroke originally from Teen Titans. I went to a panel all about “Disney in Movies,” they showcased movies that had the Disney parks in them, such as Saving Mr. Banks, Ernest Saves Christmas, and Hulk Hogans Thunder in Paradise. We then ventured to see the infamous William Shatner from Star Trek! He was just as funny and quirky as you would imagine! The house was full and he catered to any questions asked! Henry Winkler was there as well, and he sure put on a show! Finally we met with Kevin Conroy, who voiced Batman in the animated series, he talked about working with Mark Hamill aka Luke Skywalker, who voiced the Joker. I can’t wait until I can report about SuperCon next year! I walked away with some great memories, great pictures, and a few tears of nostalgia! « Service animal or emotional support animal? There is a Big Difference.